K'Nex Robotics Review - Build and Program Big Robots! 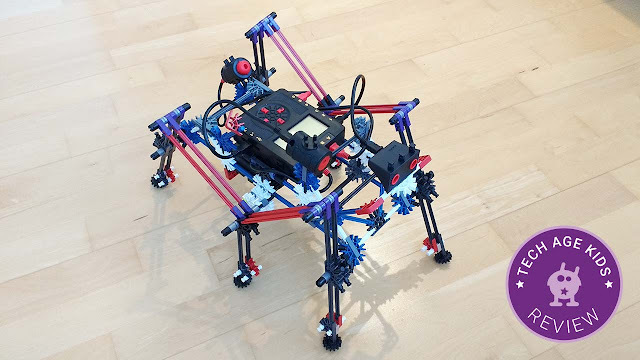 K'Nex Robotics is a new robotics kit that uses K'Nex pieces. It's designed for Education and we think it's also suitable for home use. It's a large kit that has official designs for 9 different robots. Before buying the kit and trying it out it was quite hard to understand what we would get so we've put together a detailed review so you can decide whether it makes sense for your family. I reviewed this kit with my 10 year old son who has experience with LEGO Mindstorms EV3 and the Makeblock mBot Ranger robotics kits and also building regular K'Nex Kits. K'Nex Robotics is a large kit from K'Nex Education which allows you to built multiple models controlled from a programmable Control Box. It uses K'Nex parts and models are programmed from a Windows PC using a flow chart tool. The models are large and packed with interesting mechanisms. Should you buy K'Nex Robotics for your family? 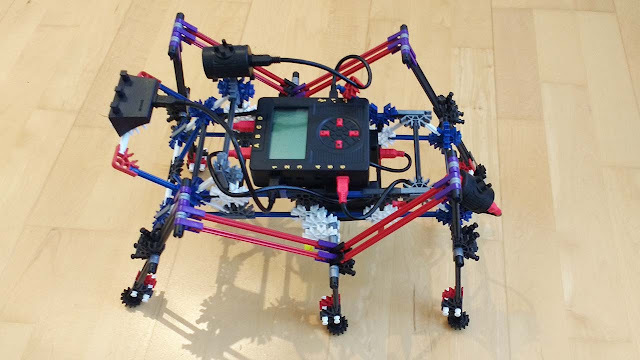 Short answer: K'Nex Robotics is absolutely fantastic for fairly technical kids aged 9 or 10 up with a bit of family support. They will have a lot of fun and, if they go far enough with the kit, will learn a lot about robotics. You do have to put time and effort into this set to get the most out of it. 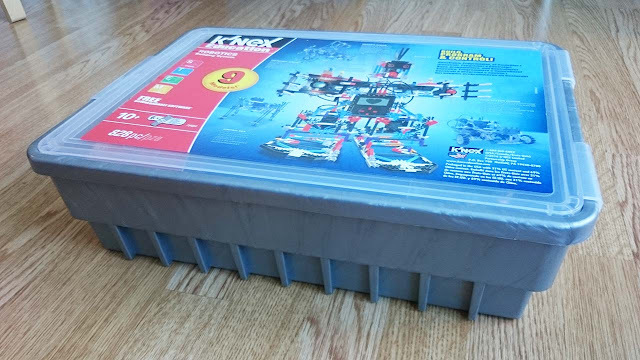 K'Nex Robotics comes in a substantial plastic box that can be used for long term storage. We're often disappointed with the packaging for products designed for home use. With multi-model kits it's really important to be able to keep the pieces up together so including a storage box gets lots of bonus points from us. The box doesn't have any internal storage for sorting components so we started by adding some storage trays and sorting the parts to make it easier to find things and to get to know the parts. The K'Nex pieces are the medium-sized ones. The sets my kids have are a mixture of medium and small K'Nex. The Mighty Makers sets use the same size pieces as K'Nex Robotics whereas some of the motorized kits we have a mix with mostly smaller parts. We also have some adapter pieces in our collection so it's possible to mix and match. The control unit takes 6 AA batteries. Alkaline are recommended for their power. There's also a power supply included which can be used during programming and for stationary models. This is a really great feature. Just using batteries when you're using a mobile robot will reduce running costs. I found one of the screws on the battery compartment very hard to get undone and the screws are very poor quality and easy to damage. I would have much preferred a clip mechanism. It's a pain to have to find a screwdriver when you want to change the batteries. There's no remote control or anything else that needs separate power. We plugged in the control unit to the mains first to make sure it was working and the display came on and told us there were no programs installed. It's very much worth noting that the K'Nex control box is ready to use immediately when you turn it on. This is awesome. There's no loading time. This means that you can turn the box off to save batteries whenever you're not using it whereas with kits that take a long time to start up you tend to leave them running to avoid the delay. You need to build one of the models and install its software onto the control box. We would have liked a really simple starter project so that we could go through that process and see how everything works. We started with the Stryder6 walker robot. This model was one of the reasons we were interested in this set, my 10 year old is really interested in this style of walking mechanism. The instructions were fairly easy to follow. My son commented that there's a lot more in each step that you would get with LEGO Mindstorms and that makes it harder. But he didn't actually struggle to follow the instructions at all. There are some sort videos available at the knex.com/instructions (search for 79100) to help with trickier parts. What he did find hard was physically snapping some of the pieces together. I helped with a small part of the model and was impressed that he was managing so well. This would be a barrier for younger children. The model took about two hours for my son to build independently. The instructions do make it possible for multiple builders to work on the same model but it's better to have another copy on a screen than try and share the instructions. I helped with connecting the USB cables as this is quite hard to do for the first time. It's tricky to work out which way up the USB micro connectors need to go and the cables are very rigid and hard to work with. The instructions just link you to a general page about K'Nex robotics where you have to find the links to the things you need to download. A dedicated page would be better. Updating the Firmware is straightforward. You just plug the control unit in, connect it via USB and run the Firmware update program. My first impression of the K'Nex Robotics Software is that it looks very dated. It's clearly an earlier product that has been repurposed. Of course the benefit of that is that it should be tried and tested. The software uses flowchart diagrams for coding. This is an approach that has been popular in education for programming control systems. Flow-style programming is also used by Meccanoid and Dash & Dot. The K'Nex Robotics software actually uses standard flowchart diagrams with a textual version side-by-side. This may seem unfamiliar to a child who is used to Scratch and Blockly style languages but it's not a bad idea for them to get experience with a different approach. It was very easy to open the program for the Stryder model and copy it to the control box although there's no onscreen feedback that you have succeeded. There don't seem to be any instructions to tell you how to create this program yourself but there are lessons for working with the software. We turned on the model and the program told us to connect the sensors. Hmm we thought we had. It took a few attempts to get the USB cables seated well. The software always told us exactly what the problem was so this was easy to diagnose. The cables mostly stayed connected once we had pushed them in firmly enough. There weren't any instructions telling us what the model did. But we knew we'd added a distance sensor so we worked out that it was trying to avoid obstacles. The walking mechanism worked really well first time so my son was very pleased about that. However we soon realised that the robot always seemed to be trying to avoid obstacles even when there was nothing in front of it. To try and understand what was happening we decided to add some debugging which got us looking at the code for Stryder. From the code we could see that the LED light on the model should go green and the robot should move forward if no obstacle is detected. Ours very occasionally flashed green and moved forward for a second but mostly it just went backwards. My 10 year hadn't done any flow chart based programming before but he got the idea immediately and could read and understand the code. He easily found the distance that was being checked (300mm) and understood that the robot was supposed to go straight forward with a green light unless it encountered an obstacle when it would go backwards with a red light and make a turn. We wondered if we had things connected up backwards but couldn't see a problem with the actual model. My son tried flipping the logic first by changing the directions of the motors and then by changing the logic of the check. He was easily able to make these changed and download the program. The lack of any feedback when a program had been downloaded took some getting used to but apart from that it was straightforward to make simple changes to the program and get them running. We decided we would like to display the current reading of the distance sensor on the screen to try and understand the behaviour we were seeing. We quickly worked out how we could use an Output block to show text on the screen and that we could get the text from a variable. Elsewhere the value of the distance sensor is referred to as "1 Distance" but when we tried that here we got an error. We don't know why. We decided to try putting the value of the distance sensor into a variable first. We could see that this involved a Process block but resorted to the manual to work out how to set a variable. We had to 'Make v = "1 Distance"'. Then would could refer to v to output the result. We were able to validate the code in the tool this time we could see a number output in the emulator. The hardest part of this process was routing the flow lines correctly. It was very hard to add new blocks to an existing chart. My son did work it all out but mostly ended up deleting things and redrawing them. It was a painful process. This is a downside of flow-based tools (we had this problem with the Meccanoid coding app too) but there are better tools than this out there. It was a shame to spend time on layout rather than coding, there may be tricks that we haven't found yet. Once we tried out new code on Stryder we found that the value reported from the distance sensor never went higher than 282 even when there's nothing in front of it. We could get lower values by placing a hand in front of the sensor but we couldn't get it higher than 282. Well that explains why it was never going forward - the code is looking for it to be greater than 300. My son changed the threshold to 250, downloaded the program, and everything worked perfectly. Success! It would be really helpful if the starter project displayed the value from the sensor. It would help with debugging and provide a bit more sample code to show what you can do. My son got really adept at transferring programs to the control box during the process of debugging and fixing the code. Using a cable to transfer the updated programs was painless as it connects instantly. You can get a Wifi add-on if you want to transfer programs remotely but we didn't feel the need. You can also control your model from the software via the USB cable without downloading but that works better for models that don't move around! K'Nex Robotics has instructions for 9 models but it's important to understand what this means. Some of the models have downloadable finished programs and some require coding. Those that require coding don't have step-by-step instructions instead there's guidance in the Teacher's Guide to help you work it out for yourself. There's also a User's Guide which explains how the software works. If you don't want to dive into the coding immediately stick to the models that have downloadable programs. Note that only one of these (Stryder) is included in the printed instruction manual. Stryder the walking insect robot. You can download the finished model for this one so you can get started without needing to do any coding. Well in theory! We had to change the code to make it work for us. A large Bi-Ped Robot. There's no final program to download for this one. There's guidance for programming it in the Teacher's guide but it's actually the second model there so you'd be better off building the first model first, which is also included in the printed manual. A Line Tracker vehicle which makes use of the included floor mat. This is the first model that's used in the Teacher's guide and is therefore a better choice for starting to code. There are also 6 further models that have online instructions which can be accessed at knex.com/instructions by entering the product number (79100.) Most of these models do have downloadable finished programs. Airplane - this has a downloadable program. Car Bot - this has a downloadable program. Basketball Game - no program and not mentioned in the Teacher's manual. You seem to be on your with this one. The K'Nex Robotics set is part of the K'Nex Education range and designed for use in schools. But it's readily available to buy for home use. We think it's a fab set for home use as long as you understand what you are getting and buy it for a child with the right level of experience and interest. Actually the models are a lot of fun and really well suited for home use. They take quite a bit of time to build and some of them take quite a bit of space to use. Both of which could be an issue in school. Building and coding one of these robots is unlikely to fit into a single lesson even with multiple pupils collaborating. At home you can take the time to really get the most from the kit and you can take the time to play with each model when you build it. Kids will also be able to customize models with their own K'Nex parts which is harder in schools where you need to make sure the kits stay complete. K'Nex Robotics would also be good for Workshops, Clubs and Camps where kids are going to have several hours to work on it. Just make sure you have room to store a partially build models in between sessions. And don't forget to include time to take the model(s) apart at the end - this does take a while and you don't want to be left with that job! We often recommend introducing motivated kids to products earlier than the manufacturers recommended age but in this case we think 10 is about right. This is because of the physical skill needed to snap the parts together, the need to assemble lots of parts in one step, the ability to use the user interface of the flow chart tool and the need to work through lesson plans to complete some of the models. Younger kids would enjoy joining in as part of a family activity. And kids who already have lots of experience with building with medium-sized K'Nex may be ready for the building part sooner. The recommended retail price for K'Nex Robotics is $399 but we have seen some early discounts on the product. These may not last if it becomes popular. You do get a lot for the money. The box contains lots of K'Nex parts in the box and a good selection of electronic components. The 9 models provide hours of building so you won't be left wondering what to do with the kit. To get the most from the kit you'll need to work through the educational material in the Teacher's Guide and will learn lots about robotics. We think this is a good thing! The models are cool enough that kids will be willing to put the effort into building them. If kids get good enough that they can design their own machines then you'll get even more from the set. 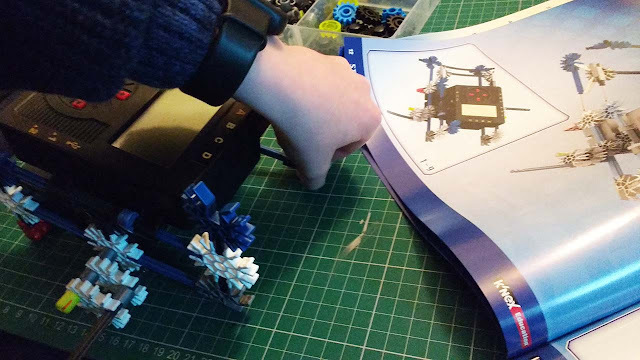 Overall we think the K'Nex Robotics kit is a fantastic way for quite technical kids with some family support to learn about robotics - the mechanics and the coding. There's plenty of depth here. The process of getting programs onto the control box is really smooth. Everything works well without annoying delays. This is really important for kids because delays lead to frustration. The included power supply is also a great feature and really saves on battery power when testing and when working with models that don't need to move around. We have highlighted some things that could improve the overall experience. But none of them are showstoppers, they just make the first experience less smooth than it could be. My 10 year old quickly got the hang of the flow charting tool even if he found the user experience a bit annoying! It's much more approachable for a beginner than being faced with a blank file in Arduino as you can discover what you can do by exploring the interface (supplemented with the manual when necessary.) But it feels more grown up than icon based tools. The issues we hit with running our first model were kind of annoying but threw my son right in at the deep end with learning the coding! The actual experience of debugging and adapting the code was really valuable and meant that we got to really experience the full cycle of working with the product. That cycle worked really well. K'Nex is great for building fairly big robots in an reasonable amount of time. We love the way the models enable multiple people to get involved in the building. This works really well for siblings or a family activity as well as at clubs or in the classroom. The models are fantastic with plenty of variety. They definitely appealed to my kids. You should keep in mind that the robots and machines you build from this set are quite large and you're going to need a reasonable amount of space to make use of them, not to mention storing them when kids aren't ready to dismantle their latest build! For kids this is definitely a positive. Using K'Nex means that it's easy for kids to customize their creations with their existing collection and create their own designs once they have learned enough by making and adapting the 9 included models.